Stuff like that. Never. Happens. Here. That’s what Naomi and her friends say, after Superman and Mongul crash in and out of Port Oswego. The fight only lasts 17 seconds, and doesn’t even make national news. Because the Pacific Northwest — a place of mystery and solitude to rival DC’s Houma, Louisiana — is just that sort of place. It’s out of the way. It’s ordinary people, just living their lives. And it’s almost a shame that writers Brian Michael Bendis and David Walker hint that Naomi may be more. With both of their masteries of characterization, an ordinary teenager living on the fringe of a world filled with superbeings is compelling enough. 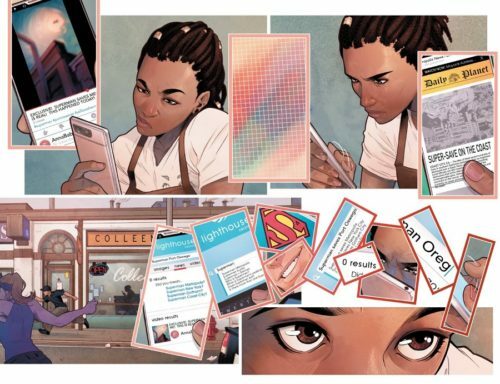 The second book from Bendis’ curated “Wonder Comics” line, Naomi has echoes of Jessica Jones and Scarlet, though definitely aimed more straightforwardly at a YA audience. But Walker’s voice is strong, too, combining to bring life to a young woman struggling to figure out who she is, before a mystery may reveal that she’s something even more than that. Naomi has a fascination with Superman in particular, for a reason that I’ve never seen articulated in comics before. Whichever writer came up with it, it provides a new perspective, and a promise that Naomi will be more about emotion and character than mystery and action. Stuff like that happens more and more in comics, but it’s still always welcome. Bringing Naomi’s dialogue to life, co-creator Jamal Campbell (colorist as well) offers a cinematic pacing and dynamic use of lighting. Early on, he even frames Naomi so she might be addressing us directly — we’re only in her head so long as she allows it. The rhythm of this book never lulls the reader; each set piece offers something new while occasionally touching back to the beginning. 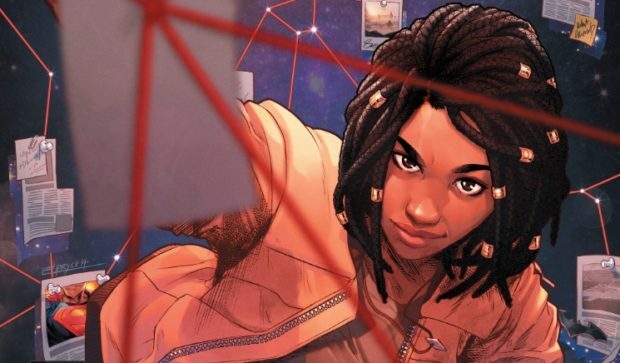 The other books in the “Wonder Comics” line play off established characters, and while I have hope for them all, Naomi is the one that’s truly special, offering something new to the DC Universe. May Naomi herself figure out that just being Naomi is enough, because she’s grand.